A material that never fails on a race track – this is how we can dub the CF-PA-12 filament – a composite material enhanced with carbon fibre, which has found its use in 3D printing. This material has been used by the OMNI3D company to print an intake manifold for a race car, which has been tested on a race track during formula races. An intake manifold of the PMT-02 race car has been created by Factory 2.0 printer with the use of CF-PA-12 filament doped with carbon fibre. This is a composite material with polyamide 12 (PA 12 carcass, enhanced with carbon fibre. It is particularly solid, highly stiff and resistant to ripping. The last feature is of particular interest here because carbon fibre is 2.5 times more durable that the popular ABS-42. Carbon fibre is used to produce parts for cars, drones – elements that are highly durable and light at the same time. Importantly, in some cases it can be implemented to replace elements that have always been made of metal. What does that mean? It means that it is is ideal for parts’ engineering, final elements production, functional prototypes and tests of construction, apparatus and accoutrement materials. An example of CF-PA-12 filament’s use is the aforementioned manifold and a radiator tunnel used in PMT-12 race car crafted by a Student Scientific Group at Rzeszów Polytechnic. 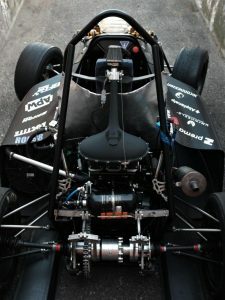 After the prototype and test period, the race car with elements printed by Factory 2.0 debuted at the Formula Student 2018 international contest. 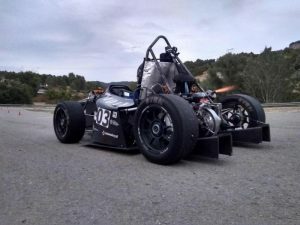 The group marked its first big achievement at races in Spain in July (July 16-22, 2018 Formula Student Andora). The team won the second place in the combustion classification, and also the special reward. Below you can see a PMT-12 race car with the manifold installe. Right at the Formula Student 2018 contest. OMNI3D team has been consequently working on improving their materials, not only in the car industry. There are ongoing research and development works regarding materials for civic aviation, which the European Airbus Group is interested in, and for the arms industry as well. The firm also participates in pro-ecological projects. It cooperates within the international consortium with the University of Cyprus. Simultaneously, a pioneer 3D FFF printing robot is also being developed. It will be using innovating materials based on, among others, the nano-ceramics and composite materials with an unprecedented in FFF technology ripping resistance. OMNI3D, introduces, improves and presents their clients with innovative solutions.